Save yourself time and aggravation with this simple application for resizing calculations. 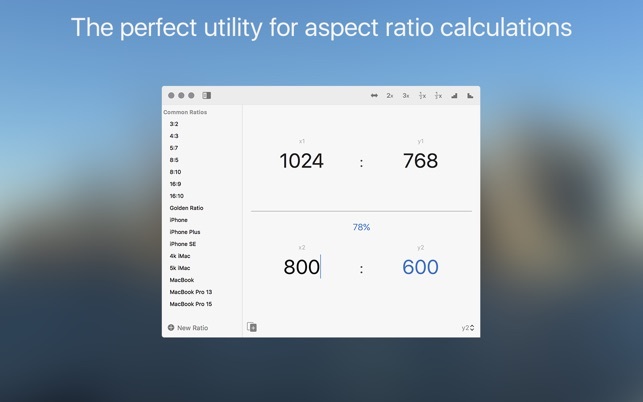 x2y is a beautifully simple aspect ratio calculator for Mac. 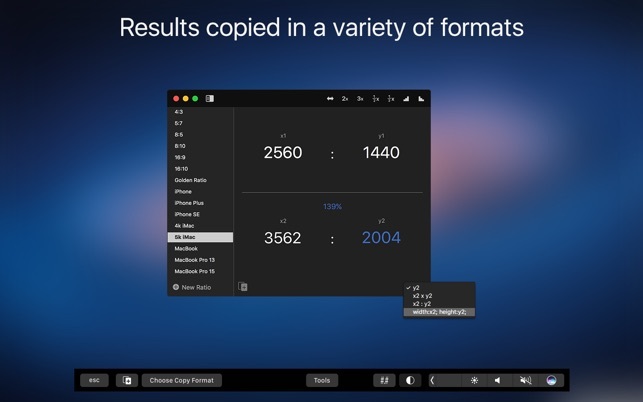 Just like x2y for iOS, this app for Mac was built for designers and web developers who need to resize images and videos in code. x2y calculates dimensions and percentages for you automatically. Just choose the original aspect ratio or size, enter one of the new desired dimensions or a percentage, and the missing dimension(s) will be calculated instantly. • Choose from a list of standard common aspect ratios, such as 16:9, 8:10, 4:3, etc. • Customize the list of common ratios to suit your needs. If you have suggestions for additional features, feel free to contact me via the support link. 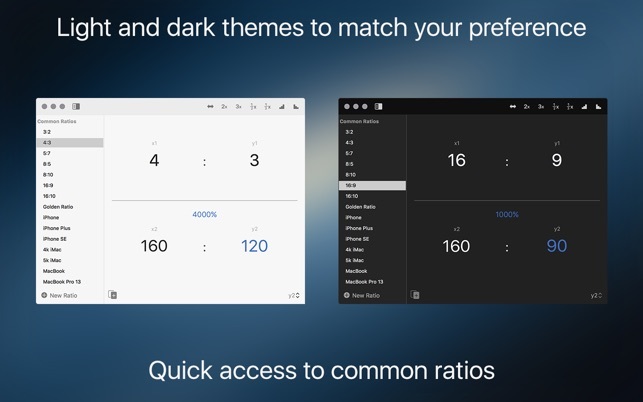 x2y has always supported dark and light themes, but now you can choose to automatically sync your theme to the current system appearance. In preferences, set the app theme to match the system theme. Override at any time using Touch Bar or the menu bar. As always, if you enjoy x2y, consider telling a friend, leaving a review, or just sharing a kind word. Thanks. If you work with ratios, the Mac app and it’s iOS sibling are wonderful little time savers. The common ratio sidebar, with the ability to customize it to suit your exact needs, is a great addition. 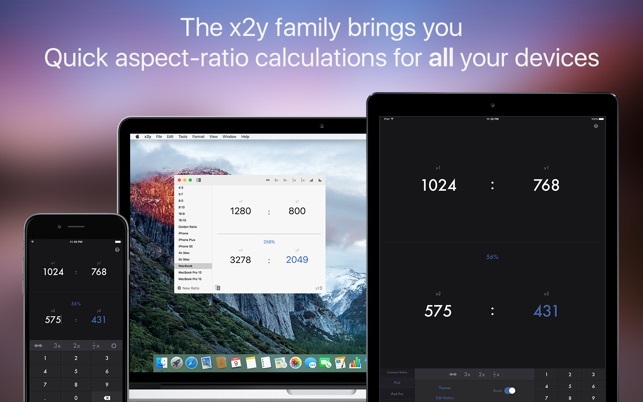 x2y is a perfect example of a focused little productivity app, sold for a fair and realisic price, that it’s target audience will find a use for day in and day out. I highly recommend it. 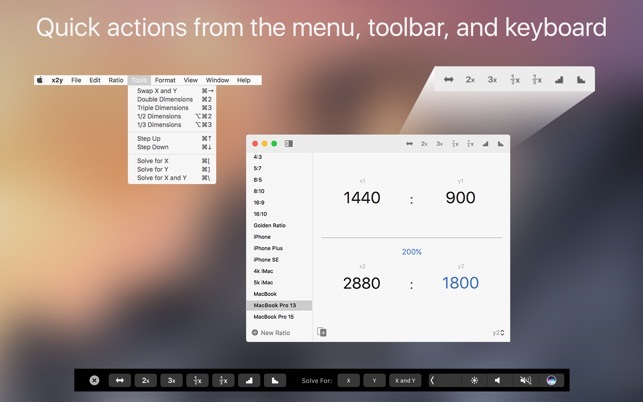 Why doesn't the desktop model have common aspect ratios built in ot the app? 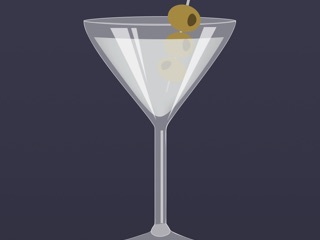 If I've spending $8 for an app, I want parity with the iPhone app. © 2016 by Joe Cieplinski.